In 8-inch skillet, cook almonds over medium-low heat 4 to 6 minutes, stirring frequently, until fragrant and lightly browned. Remove from skillet; set aside. In same skillet, melt butter over medium-low heat. With wire whisk, stir in flour until blended. Stir in half-and-half, salt, pepper and nutmeg. Cook, stirring constantly, until mixture boils. Cook 2 to 3 minutes longer, stirring constantly, until thickened. Remove from heat; cover to keep warm. In 4-quart saucepan or Dutch oven, place asparagus; add 1/2 cup water. Heat to boiling over medium heat. Cook uncovered 3 to 5 minutes or until asparagus is crisp-tender, adding bell pepper during last minute of cooking; drain. 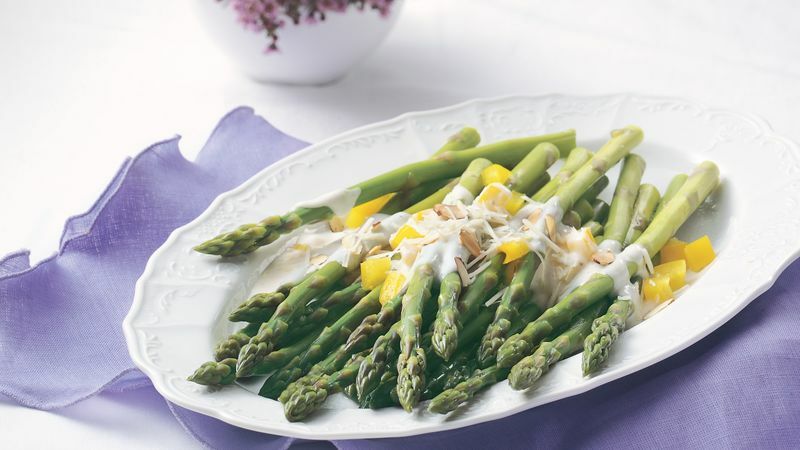 On large serving platter, arrange asparagus and bell pepper. Spoon sauce over top; sprinkle with cheese and almonds.